Tina Brown of The Daily Beast called it 'the greatest literary show on earth.' As a first time visitor, I could not agree more. The sheer vastness of Jaipur Literature Festival intimidated and thrilled me at the same time. The number of participating authors, journalists and artistes, which was more than 300, along with 30-40 thousand literature lovers and visitors can give you an idea about the size of this literary event. Then the next thing that struck me was Diggi House, the location of the festival; with its glorious historical look, it was just right for this kind of festival. Spread over five days, January 21-25, this year too the festival witnessed the participation of many veteran literary figures side by side with new voices. At a time, Jaipur Festival held four sessions at four different venues namely Front Lawn, Baithak, Mughal Tent and Durbar Hall (all at the same festival hub) and I was spoilt for choice. Many times, however, I wanted to attend two or three session going on at the same time. The first day had Orhan Pamuk, the Turkish Nobel laureate, as its star attraction. All sessions of Pamuk were over crowded. Pamuk was happy to be back to Jaipur but was pained to find there was little representation of Indian Language writing at the Litfest. He further said, during one of his sessions, that his concern was with non-Western writers who didn't write in English. 'For those writing in other languages, their work is rarely translated and never read so much. So much of human experience was marginalised.' 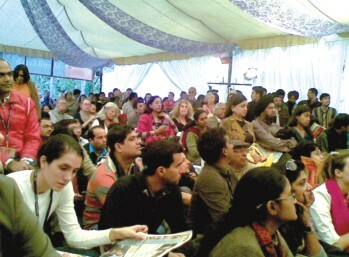 Like Pamuk, Javed Akhter's very informative and interesting session on Urdu Language was packed to capacity. The audience maintained complete silence as Javed Akhter delineated the history and politics of this beautiful language. A show titled 'Gata Rahe Mera Dil/ The Songs that Moved us', on the second day of festival, featured three renowned lyricists from Mumbai Film Industry, Javed Akhtar, Gulzar and Prasoon Joshi. The session was super hit with the audience and the organisers had to extend it beyond allotted hours. The highlight of the second day was the presentation of DSC South Asian Literary Prize to Pakistani author H M Naqvi for Home Boy. The winning novel follows the lives of three Pakistanis in post 9/11 America. On the third day, Ruskin Bond enthralled his fans with his sense of humour. They also got a treat of readings by him. Later, I saw a very long queue waiting for their turns to get autographs. Later, just before the lunch, Amitava Kumar was in conversation with Patrick French about his latest book India: A Portrait. According to French, India is the most interesting country in the world. He accepted that it was not humanly possible to encapsulate the countless complexities, diversities and contradictions of this wonderful country in a single book. So, he had tried to tell stories of individuals that flow in to larger narratives capturing a particular aspect of India's story. Amitava Kumar, as always, was witty and sharp during this conversation. In a post lunch session, on the front lawn, J M Coetzee read from his books, leaving his fans spellbound. An hour later, A C Grayling, the renowned philosopher, talked about The Return of Philosophy. He warned that the civil society should be careful while allowing the government to intrude in to their private lives in the name of real or imagined security risk. In the evening, there was a discussion on Kashmir. The panel had four young Kashmiri authors that included Basharat Peer, the critically acclaimed author of Curfewed Night, Mirza Waheed, Rahul Pandita and Nitasha Kaul. The only non-Kashmiri on the panel was senior journalist Swapan Dasgupta. Amid the experienced speakers like Dasgupta and Akbar, it was Nitasha Kaul, the Man Asia shortlist author, who stole the show with her razor sharp comments and hard-hitting arguments. On the penultimate day, the session featuring famous Indian painter S H Raza attracted maximum crowd. In a very interesting and exciting conversation with Ashok Vajpayee, Raza related to his progress from a Mathematics-hating student to a painter of international repute. Speaking mostly in Urdu-Hindi, he shared his experience of his six decades of stay in France. There was a reading session later in the evening, where C P Surendran and Jeet Thayil read from their books. Recently, Jeet's yet to be published novel Narcopolis was in news for attracting attention of many publishers. During the session, many aspiring authors were seen to be gravitating towards the legendry literary agent, David Godwin. 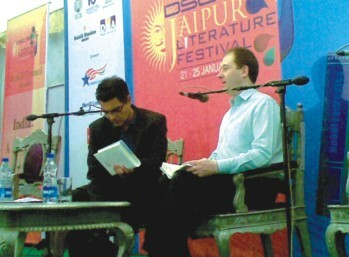 Godwin represents many renowned Indian authors including Arundhati Roy, Aravind Adiga, Kiran Desai and Jeet Thayil. On the last day, everybody looked forward for Vikram Seth's session. As expected, it turned out to be very lively. The interviewer Dr Somnath Batabyal had a knack to make any session interesting. Vikram Seth also joined him with his funny remarks. Everybody was curious to know about Vikram's forthcoming novel A Suitable Girl. There were many interesting sessions, which I could not attend, but still the visit to Jaipur was not only an enriching experience but also an intoxicating one. Vergese was right. It was different.